WE ARE creatures of habit and it’s important that fly tyers new and old don’t allow the ‘anything will do’ philosophy to creep into their tyings. So when starting out, we should try to adopt good habits and at least aim to tie something we can be proud of. Good tyers take pride in their work and if you want to tempt wily trout, it pays to take extra care. Professional tyer Bill McIlroy highlights seven essential areas where you can enhance the profile of your patterns. Read on and iron out your tying faults. Bill’s chosen pattern - a size 10 Pearly Invicta - is a true all-rounder. 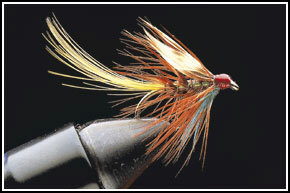 A good sedge imitation, the fly also fishes well as a fry pattern. Although not pictured here, it’s obvious that if the hook is too long for the natural you’re trying to imitate, everything else including wing, tail and body will be too short for the hook. If the hook is too small everything will appear exaggerated. These are often too short, too long, bulky or even twisted. Again this ruins the fly’s proportion and profile. This is the fly’s foundation. Remember that you’re actually building something and an uneven, bulky body results in an uneven rib. Indeed, this has a knock-on effect in that too many turns of rib are made over the uneven surface, again spoiling the neatness of the fly. 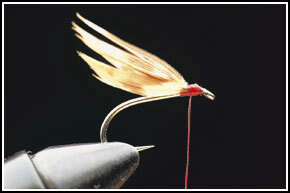 If palmering a hackle over the body, an uneven hackle is also likely. Some tyers wind the body all the way up to the hook eye, leaving no room for the head. The head has to be tied over this resulting in a bulky head. These are often too long and wound unevenly. Remember that the emphasis is on proportion. There are certain flies, especially Irish wets, where the hackles are deliberately long to create a disturbance in the water, but most hackles should protrude only slightly beyond the hook point. The fly looks better and is more streamlined. Again, these can be too long, too short or, as in many cases, off centre when looking down from above the fly. They can also be tied in wrong, namely too much of the wing is tied in forming bulk near the head region. This in turn, results in a shorter wing. If using paired slips of feather, they must be married up together, otherwise the fly’s profile is ruined. It’s worth aiming for neatness because the tail, hackle and wing act as rudders helping the fly to fish on an even keel. The head on this fly (above left) is too bulky giving a poor finish. Too thick a thread has been used. You can’t make a silk purse out of a sow’s ear and this definitely applies when fly tying. Good flies are often ruined by a poor quality hackle, for example. Don’t just choose any hook; select one that suits your purposes. Here’s a very general guide to hook sizes to get you started. These should be even at their tips, sweeping upwards and not too long or short but in proportion to the fly. The tail fibres here are golden pheasant topping feathers and these are ideal because the tips are even and there’s a regular amount of feathers along the length of the stem. Choose the ones that curve and apply them so that they curve upwards. Stop the tail from twisting by holding the fibres between forefinger and thumb on top of the hook, then lock in with three turns of thread. The length of the tail is again dependent on personal preference, but for the fly to look in proportion the tail should be no more than the length of the beard hackle and slightly shorter than the wing. On a size 10 hook, the Pearly Invicta should be no more than 15/16 of an inch from hook eye to end of tail - in other words complying to international rules. This should be in proportion to the fly and built up to the thorax area, leaving enough room for the head hackle. It’s important to remember that you’re building something, so always plan ahead and leave room for other sections of the fly. The body should be neat and without bulk, so apply the dubbing evenly to the thread and decrease the thread wraps around the hook. 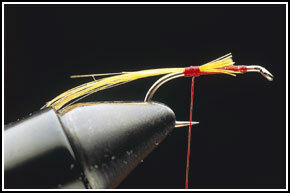 Many tyers think that a few more wraps of thread will make the fly more durable. Don’t use too many. The hackle tips should just mask the hook point. 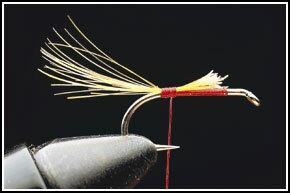 Preferences differ between tyers but remember that the hackle helps balance the fly, helping it to fish properly. Beginners can find choosing a hackle difficult. Here’s a general guide. 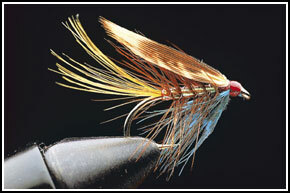 For dry flies purchase a saddle hackle. A Metz grade 1 will cater for hook sizes 12 to 18 and a grade 2 for hooks 8 to 14. A neck cape will suit a whole range of hackles from sizes 8 to 16. When using matched wings, take a left and right slip from a hen pheasant wing. Tie in by the root just in front of the palmered hackle with three to four thread wraps. The wing should be tied straight on the hook shank and this helps the fly fish on an even keel. 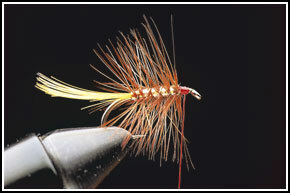 A beard hackle adds balance to the fly. To avoid an oversized head use a finer thread. I use UTC 70 Dennier which is somewhere between size 6/0 to 10/0. The head of this fly has about four or five turns of thread but I’ll use more turns if a bigger head is required on another fly. It’s important to varnish the head after casting off with a whip finish. But my advice is to select the colour thread you require and cover with clear varnish. If you accidentally varnish the hackle, you’re not going to discolour the fly. Buy your tying materials from a reputable dealer. There are many available including Veniards, David Rice and Griffiths to name a few.